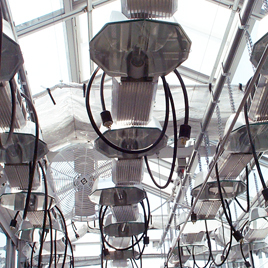 Heat for the greenhouse can be accomplished via overhead unit heaters, under bench heating, perimeter radiation or root zone heating. Overhead unit heaters (gas, electric, hydronic, or oil) are the least expensive to install while perimeter hydronic radiation is the most expensive. Winandy can provide engineering assistance in the form heat loss recommendations and equipment selection criteria within available fuel and equipment placement parameters. 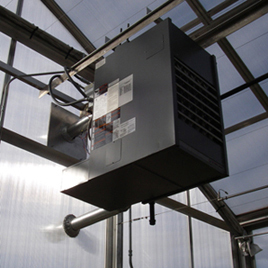 Evaporative Air Conditioning coupled with powered ventilation presents the only reasonably priced method of introducing tempered air into the greenhouse environment. 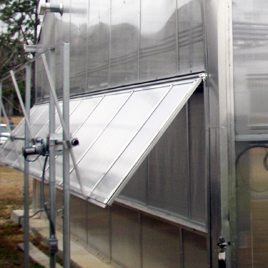 Evaporative Air Conditioning (Fan & Wet Pad) effectively reduces the interior temperature of the greenhouse to within approximately 7o of wet bulb temperature through proper placement and engineering of evaporative systems. Both positive displacement (used in smaller rooms) and negative pressure systems (used in larger rooms) can be utilized to achieve temperature reduction through evap air conditioning. Winandy uses name brand products such as Acme Engineering, American Coolair, Adobe Air, Schaefer and others to achieve an engineered solution to temperature management. Greenhouse sun control / energy curtains can be provided to mitigate solar gain during the summer months and act as energy retention curtains (pulled at night) during the winter months. Bay-to-bay pull systems utilizing peak-flat-peak mounting generally prove to be the best in most greenhouse settings for the roof area. Shaft type, rack and pinion drives utilizing push-pull technology in lieu of cable and drum are recommended for significantly lower maintenance and less structural stress. Cloths can be specified from 30% to 70% shade factor depending on the solar gain reduction desired. 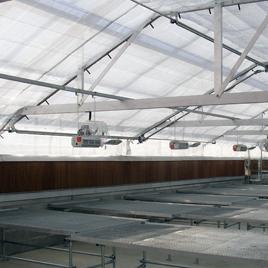 WE ALWAYS RECOMMEND FLAME RETARDANT FABRIC BE SPECIFIED FOR ALL GREENHOUSE APPLICATIONS. Full Blackout cloth is also available for photoperiod experimentation, however it must be used in conjunction with blackout curtains for sides and ends. Sun control or blackout curtains on side walls and end walls is accomplished with roll-up systems featuring linear tube motors and desired cloth. Plant Benches within the greenhouse represent the single most important furniture consideration in greenhouse design. Plant bench density and physical arrangement dictate the utilization and work flow of the space. 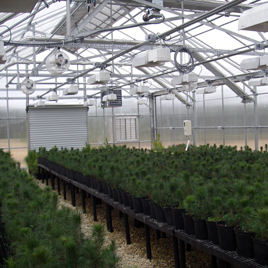 Any combination of fixed, rolling top, or castered benches may be used to achieve the goals of the greenhouse whether it is original research, teaching, collection display or merchandizing. A variety of tops including galvanized steel, plastic, or wood can be specified in a variety of sizes necessary to achieve the layout goals of the space. 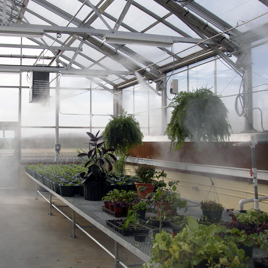 Mist Systems are generally used to increase the humidity of the space or for seed bed propagation. Mist systems are available in high pressure (small droplet with mist or fog) or low pressure (larger droplets for seed propagation). Water Treatment and water quality are a serious considerations with mist systems (most especially with high pressure mist). Watering Systems are available for on-bench, above bench, overhead or traveling boom systems. 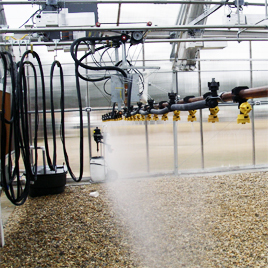 For on-bench and overhead systems, direct pot or flat watering as well as broadcast spray applications are available. 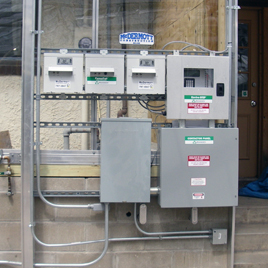 All watering systems may be controlled by separate watering controller or by digital control system. Watering systems are easy to maintain and operate with minimal end user training needed. Specialized Horticultural Lighting from Horticultural Lighting Specialist is available for installation. High Pressure Sodium or Metal Halide Lamps from 250W to 1000W are generally utilized in a variety of voltages. Client or End User needs to specify lighting level desired so that computerized lighting design may be provided. Data regarding mounting height, crop height, and usage goals need to be taking into consideration. Natural Ventilation utilizing roof vents and where practical wall vents represents the most energy conscious, efficient and quietest method of temperature reduction available. 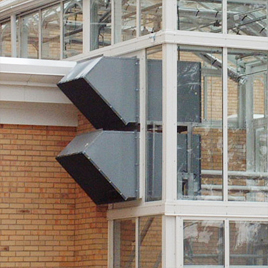 Proper programming of motorized ridge vents via the greenhouse controller will provide strong year round natural ventilation for the greenhouse allowing powered ventilation and use of evaporative cooling to be greatly reduced. Further, motorized ridge vents are completely noiseless when at rest in any position allowing conversation to occur without mechanical background noise. 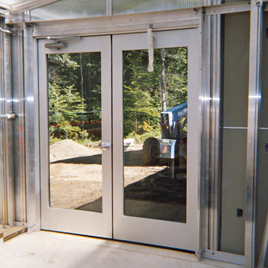 Doors of all types and uses are available for the greenhouse from Architectural grade aluminum entry doors, steel insulated entry doors, security doors, roll-up coiling doors, overhead panel doors, or sliding doors are available. The doors can be outfitted with the appropriate type of locks available for the type of door chosen including ADA, panic, or other types of hardware. Aluminum doors can be finished to match surrounding greenhouse framework. 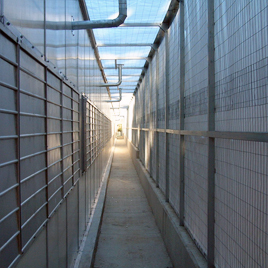 Screens are available for inlet and outlet openings in a variety of mesh configurations. Screen mesh sizes are available from 16 mesh X 18 mesh up to and including thrip-resistant mesh in such materials as aluminum, stainless, polyolefin, or fiberglass. Screens are fitted to framework or set in frames as is required for the opening to be screened. Screening of openings reduced chemicals used within the greenhouse. Reduction of insecticide use via a passive insect screening has reduced the entomological issues for all institutional and research greenhouses. Hanging Basket Rails can be equipped in the greenhouse along the bottom chord as appropriate points to assist with overhead space utilization for hanging baskets and other overhead cropping needs. 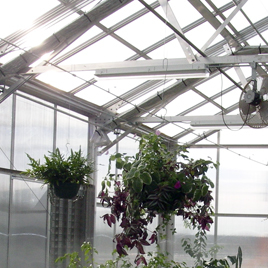 Hanging Basket Rails can also be configured with overhead watering with spray stakes or leader drops for the crop.